Eye Candy Friday: am I unpacked yet? I would say my crafting area is loosely divided into two sections – the inspirational side and the “getting down to business” side. The inspirational side is nothing more than three Billy bookcases side by side (in front of some truly unfortunate wood paneling – le sigh!). The rightmost bookcase is filled with books and patterns, and is wide open for thumbing through and perusing. 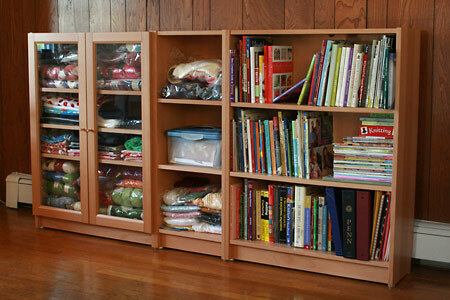 The left bookcase has yarns and fabrics, as well as glass doors to keep out the curious kitty. 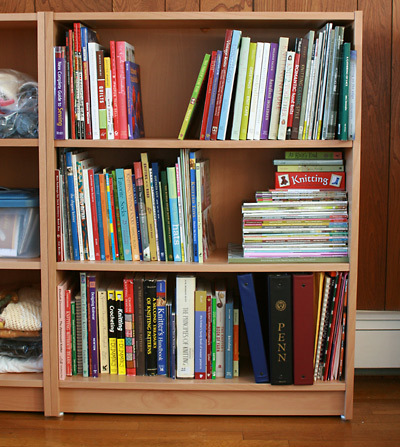 The middle, narrow bookcase has spillover from both sides. On the top shelf we have some yarns and works in progress, the middle shelf has sewing patterns (the bin with the blue lid), and the lowest shelf has finished projects. It will get a glass door shortly, because if I were to increase my stash, the new additions would go there and would need kitty claw protection. Other than notions, and partial balls of yarn and scraps of fabric (in other words, project leftovers), what you see is the entirety of my yarn and fabric stash. More than you expected, or less? I admit that I definitely have a weakness for books, pamphlets, knitting magazines, and individual patterns. If I like it, I buy it, and ask questions later. So, I was a pleasantly surprised to see that all my literary crafting materials fit into a single small Billy bookcase, with room to grow! For the first time since I started collecting knitting books four years ago, I was able to organize everything thematically. This is something I’ve always wanted to do, but never had the dedicated space to actually implement. 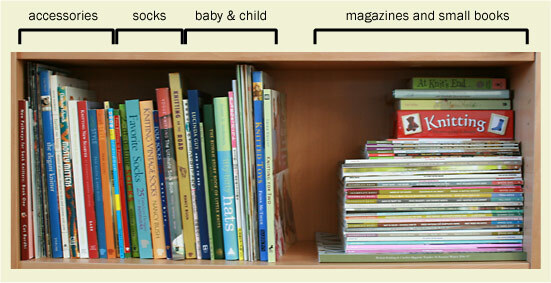 Some books, of course, are not easily categorized, so I placed them based on how I intend to use them. For example, Loop-d-Loop could have potentially joined the other baby books, but in my mind it’s much more of a pattern collection, with sweater patterns for the entire family and accessories all tossed together. In contrast, if I were to knit a pattern from Knitting for Two , it would be one of the super cute baby sweaters or hats. So, this book is together with the other baby books, instead of women’s wear or pattern collections. Books by Elizabeth Zimmermann are in the instructional pile, as is my coveted copy of the Principles of Knitting . And after perusing the books, pattern, yarns, and fabrics, it’s time to get down to business and actually make something, don’t you think? My crafting corner. It took a long time to get to a point where I’m able to dedicate a part of my living space specifically to crafting. One day it may be a room, but for now a corner is more than sufficient. Just a few things visible here: in the foreground is a counter-height table (that we found on the street – am I allowed to admit that?). I think it was meant for the kitchen, but the height is perfect for standing and working at it, be it cutting, tracing, pinning, typing, whatever. The tabletop fits my Olfa 36″ x 24″ rotary mat perfectly! As we look to the right, next we have a very simple floor lamp from Staples, with a 3-way light bulb and an Ott-Lite bulb in the gooseneck arm. In the corner are three plastic bins with notions and small odds and ends that wouldn’t work very well in the bookcases. I won’t go through all the little knick knacks contained within, but I will point out the items which have made a serious improvement in the areas of comfort, ergonomics, and/or organization. First, notice the red pouch hanging off the table’s edge. This is a catch-all for snipped threads and other small garbage; I picked it up at the New Hampshire Sheep & Wool Festival. The base is weighed down with what feels like beans or peas, and it has a swatch of slip-resistant shelf lining stitched to the bottom. The pouch itself has a wooden or plastic ring inserted at the opening so it keeps its shape and stays open. Brilliantly designed, and supremely functional. I keep my bobbins and sewing machine notions on the shelves hiding behind the red pouch. A simple box for the old Singer bobbins, and a fancy ring for the new Bernina bobbins. Feet for the machines and Schmetz sewing needles, just the basics. Next, below the pouch, you’ll see three flat plastic bins on their sides. These three ArtBins, purchased at Joann.com , are still works in progress – mostly empty as I figure out the best way to store and organize my sewing notions. My favorite is of course the large thread box – so colorful and convenient! 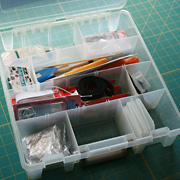 In the plastic bins attached to the door of the table I keep the essentials – the things I take out each and every time I sew. My tape measure, scissors, rotary cutter, needles, pencils, hemming gauge: they are all tucked inside the long and narrow bin. 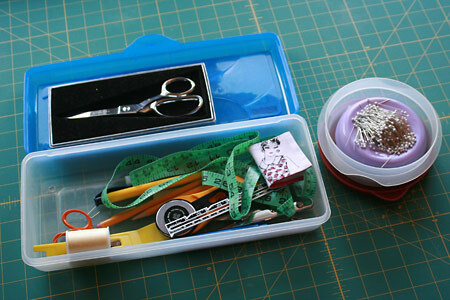 My Grabbit pin cushion , inside a protective Tupperware-style container, is also nearby. At this point I’ve exhausted all the “filler” topics, like complaining about moving, the lack of internet connectivity, my cold, the kitty, new furniture, and the parade of every plastic bin sold at Joann’s. I guess I’m going to have to show you some progress next time, won’t I?!? WOW! You are so neat! I evny you! I can’t keep an area neat for more than a few days! 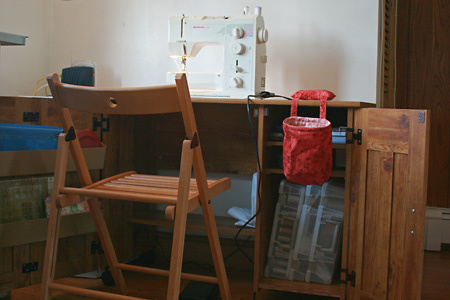 Hee, I have the same sewing table! What an admirable craft corner. I’m inspired to do something about my office. Soon. I’m with the above posters on the envy! Sadly, I know where all my stuff is as it is organized, but not to the lovely, restrained extent of yours. I don’t get to use mine nearly as often either. I love your storage system! 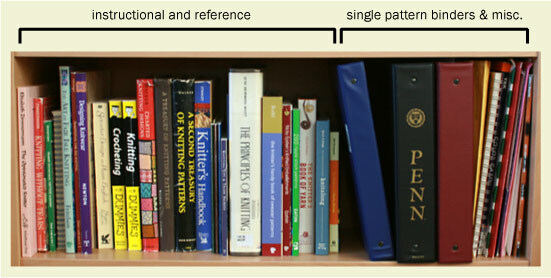 I have my knitting and crafting books organised exactly the same way! And I love your sewing cabinet too – that is my dream one day! You are so organized!! And that catch-all for stray threads is GENIUS, I need one of those so badly…might you remember the vendor selling them? I’m glad you’re back! Now that you are organized and can spread out, I look forward to seeing more of your creative, inspirational projects. 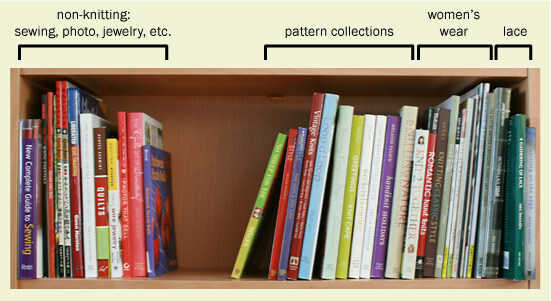 Heh, we have our books organized the same way! I can’t wait for m own place so I can at least have a craft corner. To me it feels like plenty o’ stash – I could find yarn to make nearly anything I might want to cast on. However a number of people admired the fact I could fit it all in my armoire and said their stash filled an entire room and more. And compared to some of my friends, your stash and mine are tiny! I have Billy bookcases too! One in particular I’ve had for seven years, and despite being ridiculously overloaded since I got it, it is still holding up very well. Wow – I can’t believe I missed your first post bsck. It all looks great, you must be delighted. Does this mean more dedicated time for crafting, as you will now have less set up time. You are just so organised. The stash is less than I thought you would have. But did you have a stash cull prior to moving? Great to have you back blogging, know that you were missed. So… you are coming to organize my stuff then next week? Great, I’ll have tea and cookies! I’m glad to see I’m not the only one using my old Penn binders! Looks like you have a great crafting area, so nicely organized! I found a nice dresser on the curb once. Dragged it up to my apartment, filled it with stash, perfect! When I moved out I knew most of my stuff would be in storage, so I got tough on my weeding policy. The dresser went back to the curb. 20 min later another neighbor was pulling it in again. I’ll bet that dresser is still making the rounds of the neighborhood. Seeing the usefulness of other peoples trash is a sign of higher intelligence in my book. Everything looks so neat and organized! I love that you found your table on the street… a new life for something that was perfectly good. I’ve done the same myself. Just another form of recycling – you should be proud! 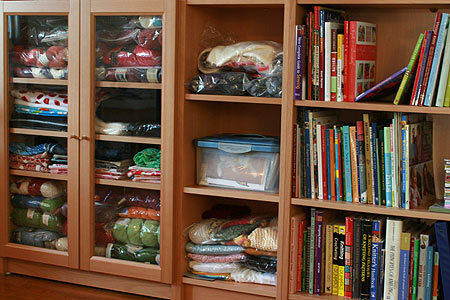 I’m so jealous of your crafting space and all those wonderful knitting books. I love the way you organized everything so meticulously. I’m so glad you got that sewing table! I may not have been the only one to suggest it back when you were soliciting ideas, but I think I was one. My husband and I are moving this weekend into our new condo and I am hoping to aquire one, too, so it’s nice to see it in action! I have the Billy bookcases with doors for my stash as well, a Christmas gift from Mr Cutey Pants. I love being in my studio and looking up and seeing my yarn. It makes it much easier to knit from my stash. I admire your simple-living style. Congratulations on the new home and more abundant space! I get so sad when I see other folk’s crafty areas…I want a space of my own so badly! Holy organized, Batman! I covet. A lot. I’ve been checking frequently and am so glad you are back. You are marvelously organized. Now I’m going to turn the laptop on its side and try to read your book titles. wow you are organized! very impressive. I guess I ‘d have to say I though you would have more stash, but then again I’m not really surprised, because you seem like a focused and project oriented person. “Nesting” is so much fun. And it is fun to watch someone else discover its joys. I’m with Jadielady. I have a my section of the sofa (which is mostly where I sit when I craft), but mostly I have one wooden nightstand thing and a shelf in the closet. I have a huge stash for my space, because a lot of it is packed away. Bliss, pure bliss. You lucky girl. Progress? Nah! We’re a fickle bunch. Just show us some yarn or a new gadget and we are entertained for a good long while 🙂 The crafty stuff looks so nice, glad you have the space to organize it now. I’m sooooo envious!!! I wish I had your organizational talents! That looks fantastic! BTW, unfortunate wood panelling can be painted over very successfully…. That looks like a great space. How big is your crafting corner would you say? 70-90 square feet? That’s a chunk of your old space I’d say. Congratulations on the move. I myself am moving this weekend and have realized that the room my 2 boys are to share is a wee bit too small. Oh well! So glad you’re back and all organized. Let the games begin. I wish my crafting area was that tidy… kudos to you! I admire your organizing skills. I need to first go through boxes, and be fairly brutal. Then I might actually hire a person to assist in the organizing. My mind works in a “brainstorming” fashion, not an organized fashion. 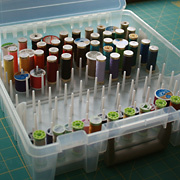 I will get one of those thread boxes the next time I go to Joann’s!! I figure it will either be on sale, or I will use my coupon. I have a lot of the big spools for my embroidery machine. Thought I recognized the IKEA. You are incredibly organized…I am jealous. Sharing this with my friends is very tempting. There are some who don’t even craft but ARE organization cultists who would loooooooooove it! What fun! I love seeing how other people organize their stuff. I’m jealous of the dedicated spot for crafting. My stash is stashed all over the house. You make a normally organized person seem like a slob. Wow-you are an inspiration! Those Billy bookcases are SO cool. Your stash? Way smaller than I expected! Kudos to you for self-control and being so organized! 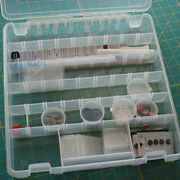 this is awesome – I also like IKEA for my craft (and doll) storage needs! 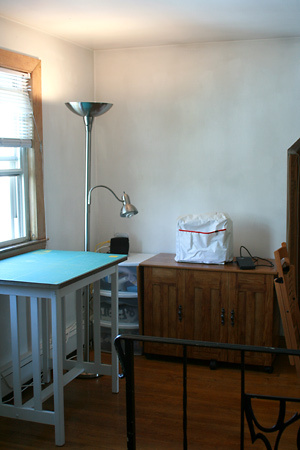 We are moving too this fall, to a house where I’ll have a wee little sewing/knitting room. What a great crafting area! Having moved around a lot (and gained/lost crafting and storage space accordingly) I definitely appreciate the satisfaction of your new space, and loved livng vicariously through your pictures! 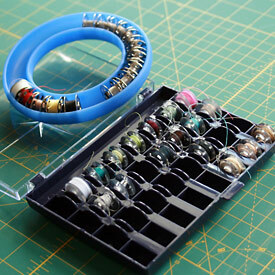 Wonderful crafting organization. My stuff is lying around all over the house, the only thing is I’m extremely careful to have it out of the dog’s reach. But other than that… I need to set up some kind of organization, thank you for the inspiration! Just to make us feel better, would you do a picture of the “corner” while you’re in the middle of a project there? A little bit of clutter would help us not feel so bad about our own more messy spaces!!! I’m not QuIte as organized, but I’m always working on it. I think your rescued table was a breakfast bar with 2 stools that matched, as I had one quite similar. Also, if it’s an option(not sure if you’re renting or own) I had the same unfortunate paneling once, and a good primer and some paint made an awesome transformation until we could remodel. Oh yeah, I stalk, er, check in frequently, cuz I heart your blog and wish I were as entertaining as you. Reading this had made me realize I need to add one more thing to my list of essentials in my new home. 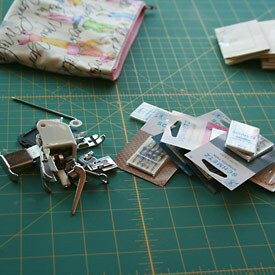 A place to leave the sewing machine set up.